*Adapted from the traditional "It's Hard To Be Poor" and Rev. Gary Davis' "There Was A Time When I Was Blind"
1) The traditional song: "Hard Times In The Country Working On Ketty's Farm"
2) Adapted from the traditional "It's Hard To Be Poor" and Rev. 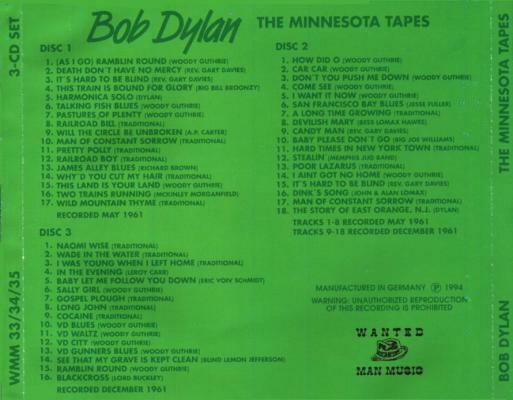 Gary Davis' "There Was A Time When I Was Blind"
3) Adapted from the traditional "900 Miles"
4) Adapted from Woody Guthrie's "Sally Don't You Grieve"
The December tape has been in wide circulation for many years. It was actually the first bootleg ever produced. It was released on a 2 LP set in 1969, and went by the title 'Great White Wonder' It has been available under various titles a countless number of times in the decades that followed. The quality has generally been very good, and the performance tells the story of a fresh faced boy just out of high school, who had the energy and natural 'world-traveled weariness' quality that would forever change the world. It is absolutely required material for even the smallest collection. The May tape has never enjoyed the same popularity. Partly because of the low quality of the original recording, and partly due to a remarkably uninspired performance. 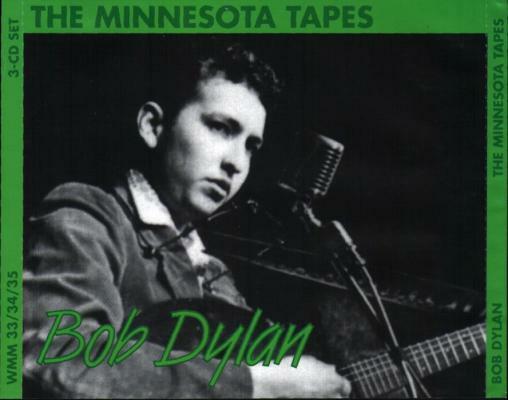 One of the first times that a young Bob would hear himself on tape, nerves, inexperience, and limited repertoire would result in, at best, this mediocre offering. The tape is significant, however, not only for its historical importance, but also as a standard to compare the December tape. A short seven months that separate the two. A lifetime that separate the two. 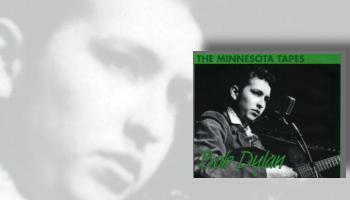 The interim shows the explosive growth from a kid with a guitar to a Folk Phenomenon. This unique package from Wanted Man presents the two tapes together. As is with most titles from this label, the package is minimal, but the cover photo is priceless.